A 100% open formula company, with a 100% open formula protein! This is nearly unheard of in the industry, and Muscle Elements is delivering everything that we’ve wanted consumers to get. T.R.U.T.H. stands for Taking Responsibility to Utilize Transparency and Honesty. Don’t think you know Eric? I’ll bet you do. Eric was a head honcho at BSN for several years – he was one of the main guys behind the launch of the original NO-Xplode and Syntha-6. That’s right: he is one of the guys responsible for creating the pre-workout category! Can he change the industry a second time around? Who knows, but let’s just say that we’re not betting against him. Tomko knows his business, and he’s got a team of rock stars around him at Me. 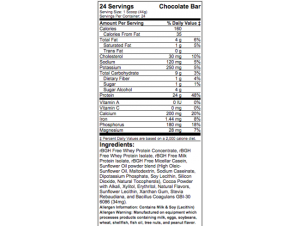 The Truth is gives us just that (“the truth”) when revealing the make up of its protein blend. Very few companies give the entire breakdown of their protein blend, but we have a gram-by-gram breakdown of each of the 4 types of protein included in The Truth. At PricePlow, we’re thrilled anytime a company lists the exact content of their whey protein concentrate (WPC-80, in this case). Normally, companies only state “whey protein concentrate” on the label. In case you weren’t in the know, whey protein concentrates varies anywhere from 35-80% protein by weight. The Truth uses WPC-80 which means that 80% of the concentrate is pure protein with minimal amounts of fat and carbs. When other companies just list WPC on the label, you could be getting 35% protein or 80%, you really have no idea of the actual protein content. 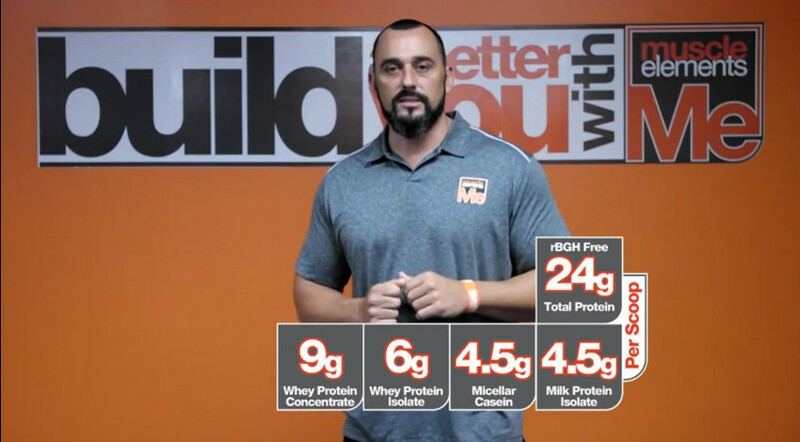 The Truth also utilizes two isolate forms of protein, whey and milk. Whey protein isolate is a great option for those who have experienced previous digestive issues with pure whey concentrate products before as it’s has little to no lactose remaining after processing. Milk protein isolate consists mostly of casein protein, so this will lend a rich and creamy texture to your protein shakes. The Truth is one of the rare breeds of protein that gives the exact composition of the various proteins contained in its blend AND includes no artificial sweeteners! This looks like a very good mix that will combine texture, mixability, taste, and value. And knowing Mr. Tomko, it’s likely going to taste ridiculously good. Update: On the note of “no artificial sweeteners”, we’ve enjoyed this protein so much that we are now ranking it as the #1 naturally-sweetened protein powder in our Best Protein Powder buyer’s guide! If this is your first time on our blog, then a must-read is our write-up on Amino Acid Spiking, which explains how companies are using FDA “loopholes” to legally give you inferior protein products. Meanwhile, there are also companies that are illegally lying about the contents of their protein. We will continue to fight against both of these practices, while supporting companies like Muscle Elements who open up the labels more. Muscle Elements has taken this one step further by posting lab test results of their protein powders! You can check the actual test reports yourself. Simply go to the Lab Test Results page on Muscle Element’s website, enter your the lot number in the text box to find “the TRUTH” on your particular bag of protein. Side note, the lot number can be found on the back of the package in the lower right-hand corner. This is yet another trend that we’re starting to see more and more of in the supplement industry, as companies such as MusclePharm and BPI have begun posting testing results to assure their loyal fans that what they are paying for is what they are actually getting! Thumbs up to M.e. for staying ahead of the curve and giving the people what they want, transparency and test results! In terms of sweeteners, you have a mix of sugar alcohols (Erythritol and Xylitol) followed by Stevia. 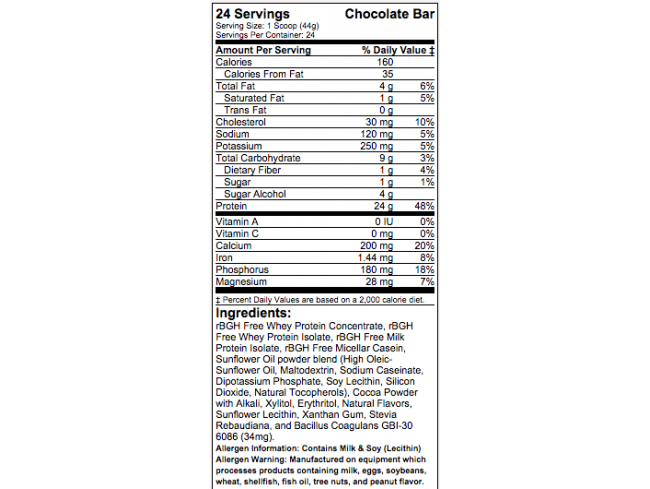 If you like dark chocolate, you’re going to love the chocolate bar flavor. It’s dark and it’s phenomenal! With an open formula and this taste, Muscle Elements has put themselves on our Best Protein Powder flowchart and has firmly placed themselves in the Top 10 list as well! Currently, The T.R.U.T.H. is available in two flavors: Chocolate Bar and Vanilla Wafer. You can get either, or both, of these flavors in a 24-serving 2.3-lb tub, just make sure to check the widgets on this page for where to get the best deal. We already told you how rich and delicious tasting the Chocolate Bar flavor is, we have the same high hopes for the Vanilla Wafer flavor as well! That said, let’s give credit where credit is due. One of the only other products to go 100% open protein? JYM Pro JYM, which is already a best-seller. We hope for this one to come in at a slightly better price though, since JYM sells at a premium. The T.R.U.T.H. is a one-stop shop for all of your protein needs. It’s packs 24g of high quality protein, with no fillers or free form aminos to detract from its wholesome goodness. Sure there are only two flavors, as of right now, BUT knowing how masterful Eric is in the flavoring department, you can rest assured that it will be one of the best tasting proteins to have ever passed your lips. So, grab a tub and let us know your thoughts and what flavors you’d like to see in the future! No Comments | Posted in New Products, Supplement News | Tagged Eric Tomko, Micellar Casein Protein, Milk Protein Isolate, Muscle Elements, Protein Powder, Whey Protein, Whey Protein Concentrate, Whey Protein Isolate.